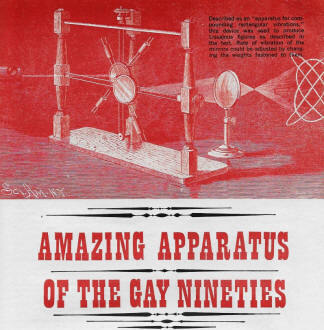 Carleton Phillips was not minimizing his predecessors when he wrote this 1966 Popular Electronics article marveling at the accomplishments made in "Gay Nineties" (1890's) in spite of their relatively crude resources. Seven decades had passed since then. A similar article could be written today, five decades hence, about today's knowledge and technology compared to that of the mid 1960's. For instance, DNA had not yet been sequenced, 3D printing did not exist, Al Gore had not invented the Internet, MRI machines were not available, there were no cellphones, PC's were only a dream, booster rockets could not land self-powered for re-use, TV's used CRT displays, vacuum tubes still dominated consumer electronics, automobile air bags weren't saving lives and limbs, Lasik surgery wasn't even in an experimental stage, supersonic flight was (and sadly is again) the sole domain of the military airplanes, satellite-based global navigation was non-existent, and the list goes on. Someday, an AI machine will write yet another a similar article about the crudeness of technology in 2018. Have you ever wondered what experimental science was like around the turn of the century - before the days of the amplifier, oscilloscope, vacuum-tube voltmeter and the other scientific paraphernalia commonplace in today's laboratory? In an age that lacked so many things we take for granted, it seems incredible that a science of any standing existed at all. Exist it did, however. Where we now use precision instruments manufactured by the thousands, thanks to our advanced technology, the experimenters of grandfather's era painstakingly fashioned measuring devices of wood, glass, metal, and string with an ingenuity born from necessity. 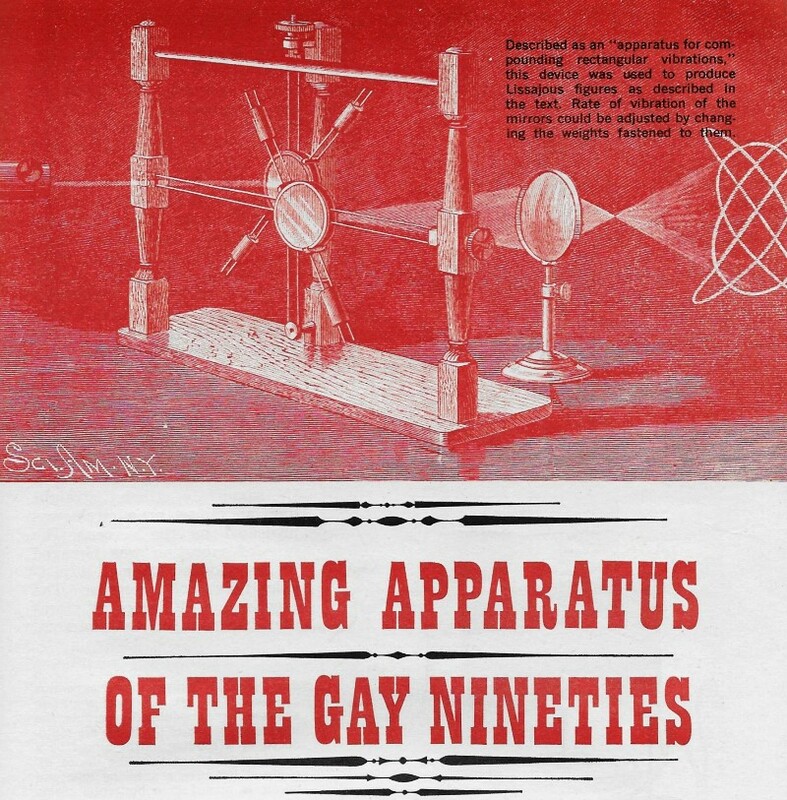 Despite the fact that intuition must have played a large role in interpreting results, it is intriguing to note the many worthwhile experiments that were conducted with the crude - yet amazing - apparatus of the Gay Nineties. The Patterns of Lissajous. Today, the name Lissajous, used to refer to oscilloscope patterns, is part of the jargon of all electronic technicians. The term had its origin with Jules A. Lissajous, a 19th century French scientist who discovered the patterns and their scientific significance in analyzing waveforms and determining frequencies. 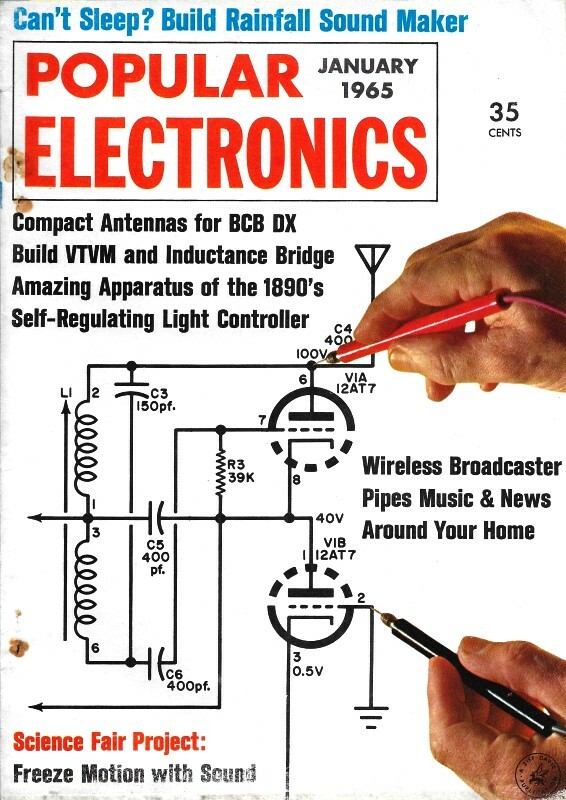 The apparatus employed by Lissajous, however, was a far cry from the modern oscilloscope which produces patterns electronically. It consisted basically of two small mirrors facing each other and held in place by rubber bands. The rubber bands holding one mirror were stretched in a vertical position, while the other mirror was suspended by rubber bands fastened horizontally. Two types of vibrating flame apparatus are shown. 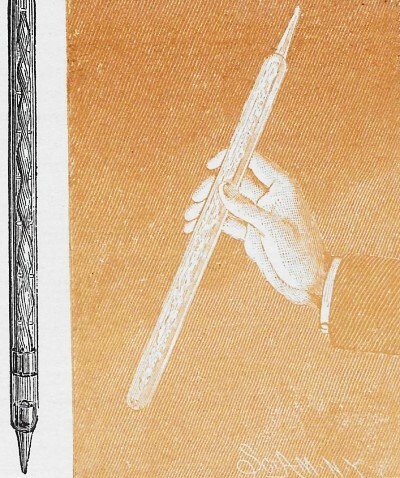 Engraving shows a flame modulated by a flute; the minute vibrations of the flame are reproduced by a rotating mirror turned by a hand crank. 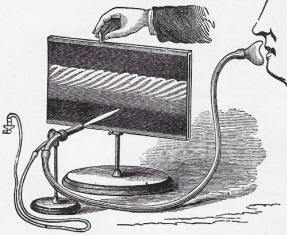 A variation, the device uses a speaking tube and mirror is moved in a horizontal plane. A beam of light was directed upon the mirror facing it. After reflecting back to the second mirror, the light beam was next focused by a convex lens to form a small spot on a wall or screen. Each mirror was struck lightly, causing one to vibrate horizontally and the other vertically. When the mirrors vibrated at the same rate, either a straight line, an ellipse, or a circle was projected on the screen. The rate of vibration was changed by the addition of small adjustable rods and weights. The greater the difference in vibration between the two mirrors, the more complex the projected pattern, as shown in the drawing on page 39. The "Speaking Flame." To show the waveform and characteristics of sound, experiments were conducted with the help of such (to us) unorthodox apparatus as rotating mirrors and vibrating flames. One of the simpler pieces of equipment consisted of a funnel-shaped mouthpiece attached to a hose. The hose, in turn, was fastened to a specially designed gas burner. Although the flame of the burner was influenced by a sound transmitted into the funnel, the minute vibration of the flame was indiscernible when viewed directly. The modulation of the flame could, however, readily be seen when reflected from a rotating mirror. Another experiment along the same line was billed as the "speaking flame." This, too, used a speaking tube device consisting of a mouthpiece attached to a hose which, in turn, was fastened to the base of a specially designed gas orifice. A funnel-shaped resonator was attached over the burner to complete the device. 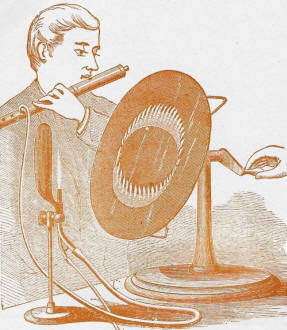 The sound waves that reached the burner through the speaking tube acted directly upon the base of the flame, causing the flame to reproduce sound. With the flame turned off, no appreciable amount of sound was emitted from the resonator, thus proving that the flame itself was emitting the sound. Electrical Experiments. In the field of static electricity, there were such devices as the electroscope, the electrophorus, Wimshurst machine, Leyden jar, etc. Many of these devices are used presently in some of the experiments conducted in modern-day schools. Not so well known, however, is the self-exciting Geissler tube. 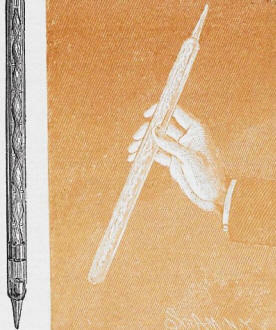 This device, depending upon static electricity for its operation, consisted of two glass tubes arranged concentrically; the inside tube was beaded and provided with little knobs (see drawing on page 41). The device was partially filled with mercury and the air evaporated. When the Geissler tube was turned to a perpendicular position, the mercury ran down the inside, causing the device to emit light momentarily. This was due to the static electricity produced by the movement of the mercury upon the inside surface of the glass. The beading on the inside tube impeded the fall of the mercury, preventing it from breaking the glass when it reached the bottom of the tube. Surprisingly, a practical use was found for the Geissler tube: A limited number of self-luminous marker buoys were constructed on the Geissler principle. 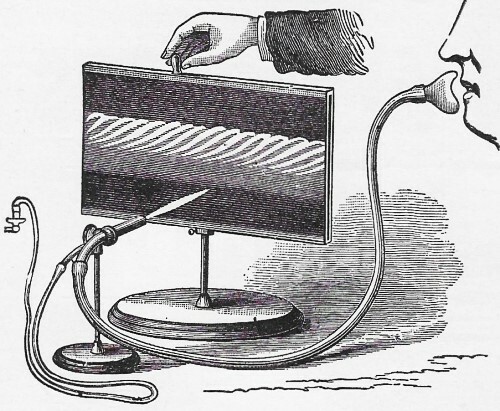 The self-exciting Geissler tube used static electricity to produce momentary flashes of light. One version of the device, which was evacuated and partially filled with mercury, found application as a sea-going marker buoy. Several types of gyroscopes were used for classroom demonstrations of the earth's rotation, among them the battery-powered version shown at right. Other units were powered by steam or with a crank. 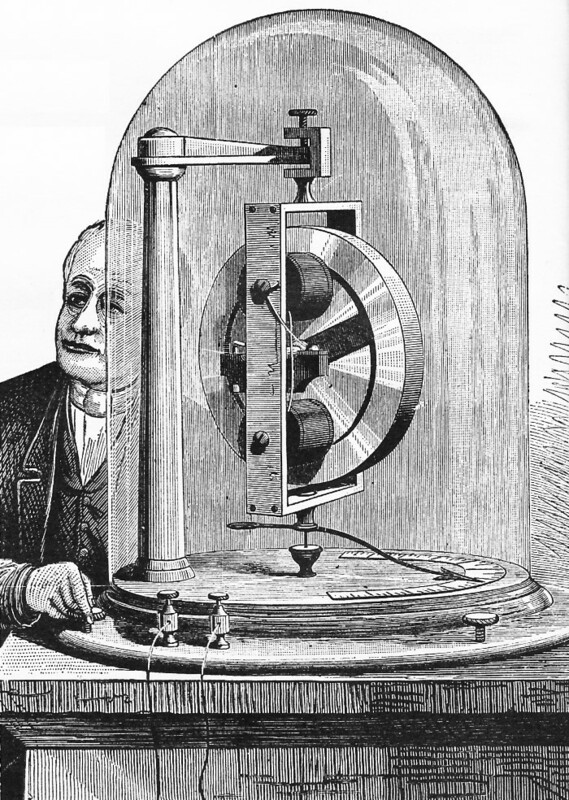 Experiments in dynamic electricity were not out of the ordinary at the turn of the century; the equipment, however, such as the expansion voltmeter or the ammeter (which employed a diaphragm and mercury) , seems weird and cumbersome by today's standards. Basically, the expansion voltmeter depended upon the linear expansion of a thin platinum wire when an electric current was applied to it. The platinum wire was coupled to a needle or pointer that was arranged in front of a graduated scale. 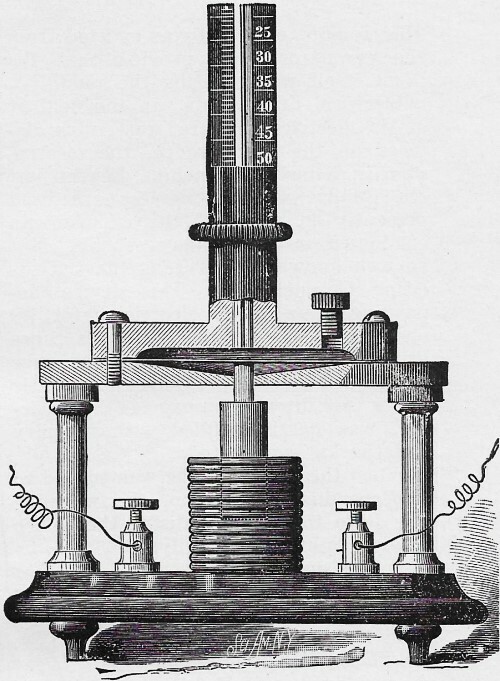 The ammeter consisted of a coil with a movable core inside it, the core being mechanically coupled to a diaphragm. The diaphragm, in turn, controlled a column of mercury similar, in nature, to a mercury thermometer. The more current applied to the coil, the shorter the column of mercury. Current was read by marks or graduations engraved alongside the column. The Gyroscope. Outside of a few minor applications, the gyroscope was principally a scientific toy during the early nineteen hundreds. Although the first versions of the gyroscope were a far cry from the extremely refined and perfected versions that are used in our modern guidance systems, considerable ingenuity was demonstrated in their construction. Some of the early gyroscopes were powered with a hand crank, others pneumatically. A few battery-powered models were available, as was a much rarer steam-driven type that generated its own power within its moving parts. Although the physical sciences have made tremendous advances over the past sixty years, it is difficult not to find something to admire in the instruments of those who pioneered this progress. And, lest we feel too superior, the instruments we consider advanced today are bound to become the cumbersome curios of tomorrow. 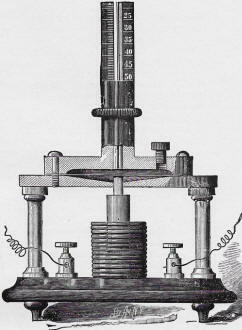 In crude ammeter above, current flowing through coil pulls a movable core down, activating a diaphragm and causing mercury in tube to fall. Device above is expansion voltmeter; it depends on linear expansion of a thin platinum wire when voltage is applied. Wire is coupled to pointer in front of scale.